I didn't grow up eating Mulberries, but I'm glad I discovered them a few years ago. These are some of the tastiest berries I've ever had. Most have really low acidity so they have more of a sweet melony flavor. They resemble blackberries but by far much tastier and not invasive. Here in the PNW blackberries take over every ditch and greenbelt. It's somewhat annoying since they are so persistent and very hard to kill. At the moment I have a Pakistani, Illinois Everbearing, White, and Red. The pakistani is very good. I plan on adding the himalayan when it becomes available. I love the extra long fruit sizes. The sweet white fruit will not stain like the darker mulberries! Eat it fresh, or dry it for snacking later. The tree grows to about 30'. 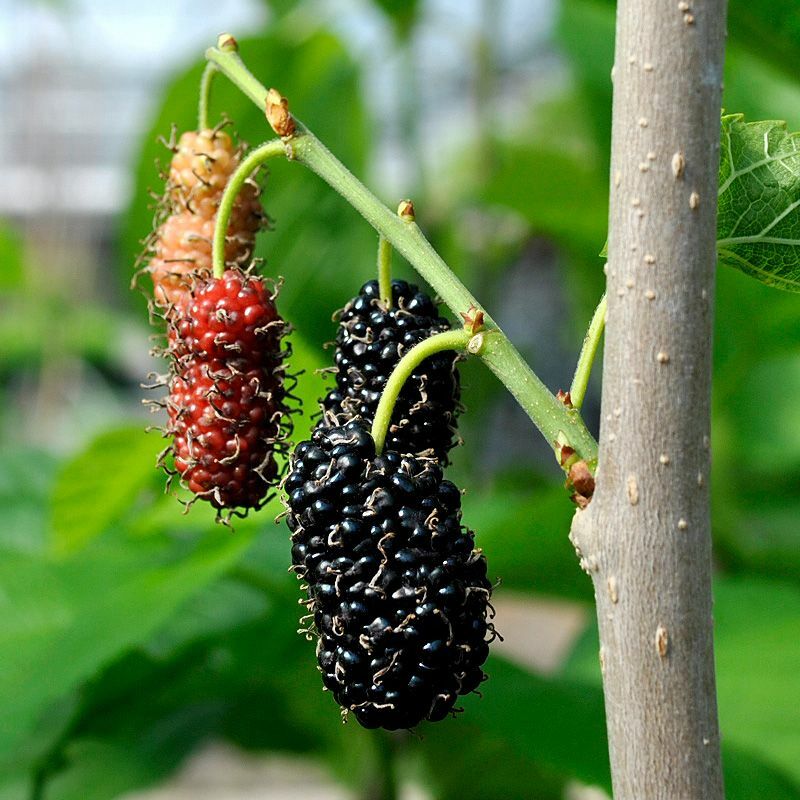 Boysenberry Black mulberry is a Just Fruits find. The original tree was found at an old homestead Wakulla County Florida. Strong growing trees bear hefty crops of gigantic 1 1/2 inch long seedless black fruit. Distinct tart ‘boysenberry’ taste makes for great jam. Fruit ripens in May. Zones 7-9. A fruiting ‘sport’ of the contorted mulberry Morus bombycis or Morus alba ‘Unryn’ (Dragon in the Clouds Mulberry) This tree was brought to our attention by Linda Bennet of Crawfordville Florida. Linda bough the original tree from us several years ago. She planted it as an ornamental and was surprised to find it fruiting soon after planting. Sports or branch mutation do happen in the world of fruit trees and often this is what gives us a new variety of fruit. Named after a relative she is quite fond of, Callie’s Delight has all the great features on the original contorted mulberries with it’s gnarled and twisted branches. But it bears fruit too! Fruit are large over an inch, black and super sweet. Fantastic fast growing shade tree. Grows to 30 feet. Zones 5-9. 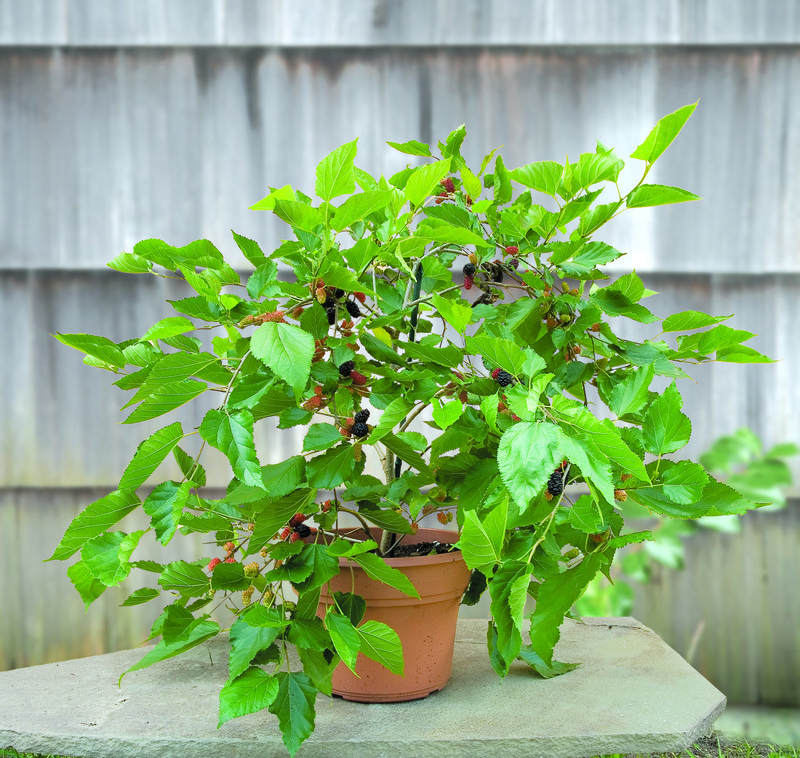 DWARF BLACK MULBERRY (Morus nigra) Mulberry fans consider this black mulberry the best flavored of all. Large soft, juicy, intense, sweet/tart berries from July to Sept. By far the most staining of all mulberry. Fruit with significant, blood red, messiness potential. 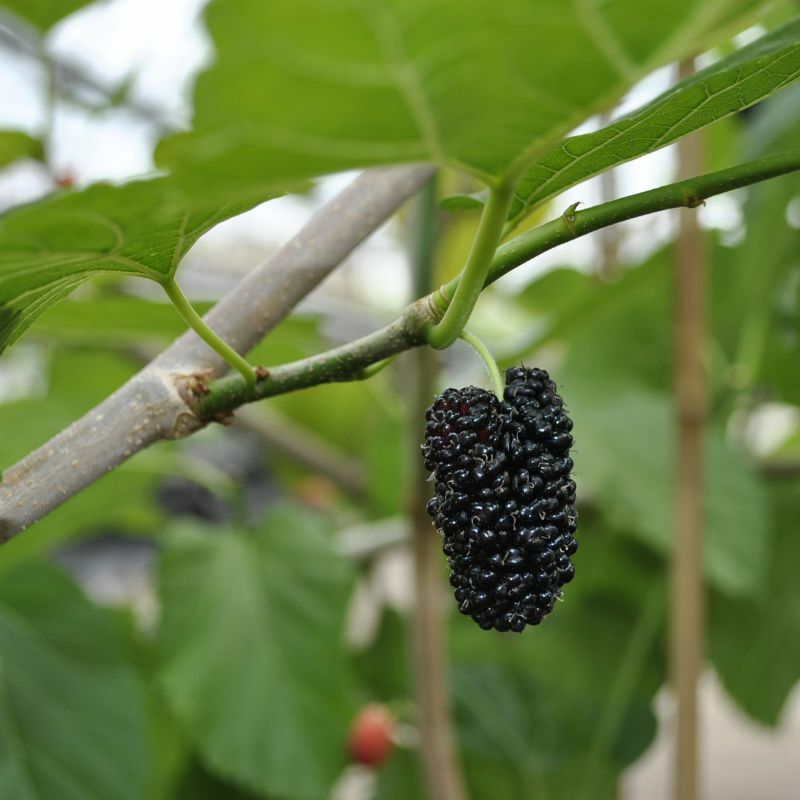 Dwarf Black Mulberry is a natural dwarf, branching low, so it will be a 6-10 ft bush or can be pruned as a small tree. Of central Asian origin. Mysteriously, this species is not found anywhere in the wild. A polyploid (over 300 chromosomes in the nucleus instead of the usual 12) it generally has sterile seeds. Not widely adapted outside the Pacific Coast states & Southwest as it is only hardy to about 0° F and too disease prone in the humid Southeastern U.S. Zone 7-10. Very distinctive. The best for long sweet fruit. It is actually hardy to zone 6. It can take heat and humidity better than M. nigra, the other species for recommended for its fruit. It grows well both in the South and the Pacific coast. 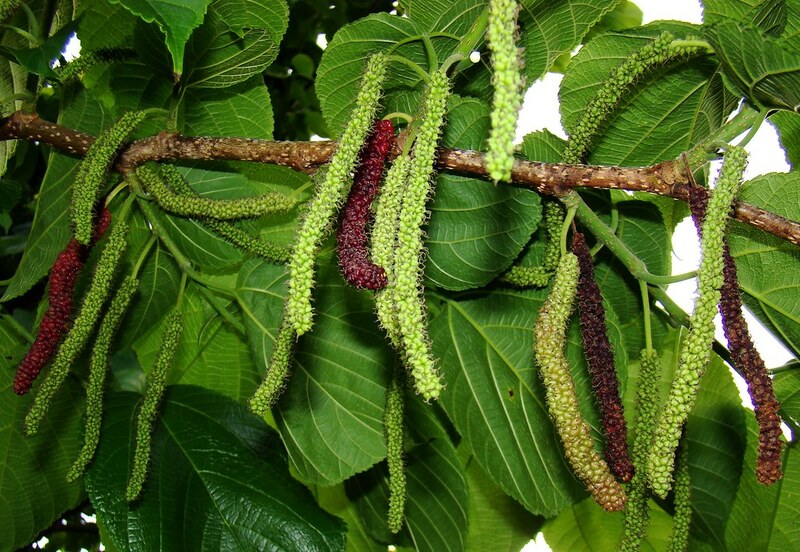 Ho’O is a Japanese variety of Morus alba whose name means king or royalty. The leaves look like a living topographic map. The area between minor veins is distorted, so the leaf surface is crinkled or raised. Great yellow fall color. Mid size sweet black fruit. Ripens in May. Zones 5-9. Sweet and delicious large dark fruit can be 2 inches long and 1/2 inch wide and ripens over a long season. Ready to eat earlier than Illinois Everbearing and is said to be even hardier, grown as far north as Minnesota. Vigorous precocious tree comes into bearing early and produces heavy crops. From Korea it is hardy zones 5-9. Just like the Pakistan mulberry, Shatoot has long up to 4 inch seedless fruit – but they are white! If you like super sweet this is the mulberry for you. Fruit dries well for mulberry raisins. Fast growing trees one of the best edible landscaping shade trees. Fruit ripens in May. Zones 9-10. Extremely long 4 inch large dark purple fruits that are sweet and flavorful. Moderatly hardy trees are recommended for mild winter climates, but can also do well in cooler areas. Zone 6-9. Persian (Morus nigra) Local Orleans California strain, Dense compact unique tree does well in the maritime North West. 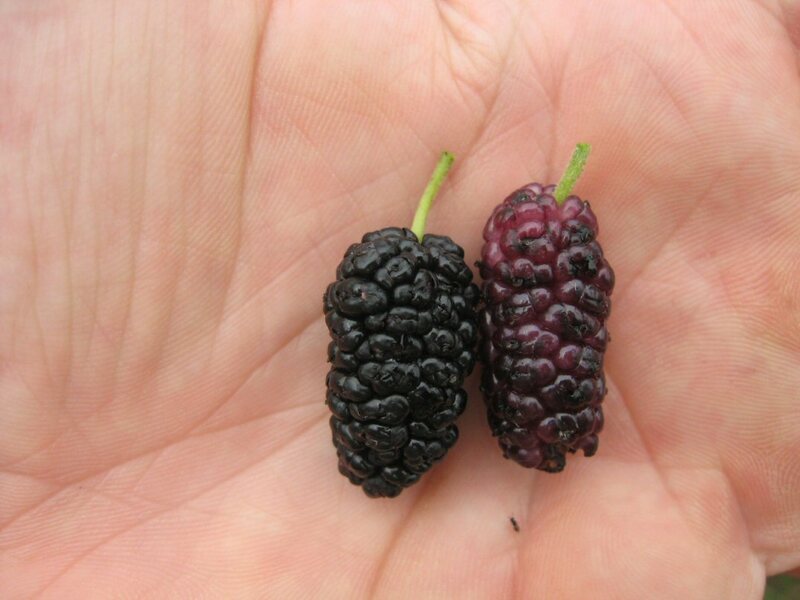 The delicious purple black large juicy tart-sweet fruits are considered to be the best tasting of all mulberries. Fruit ripens in late summer over a long season. Hardy to 0 degrees and once established somewhat drought tolerant. Ranger Ken’s mulberry was brought to our attention by several customers. We heard often about the incredible mulberries of Railroad Square. Railroad square is a industrial park turned art district in downtown Tallahassee. It is situated next to the historical old railway depot. The lots that surround the district are filled with seedling mulberries. 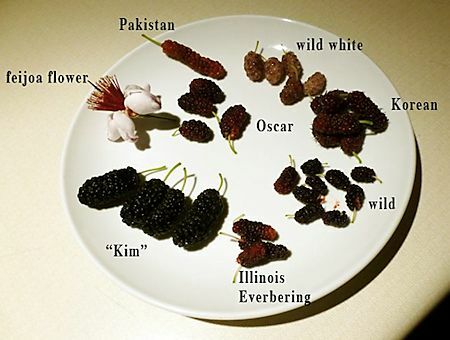 Most are black but there are a few white mulberries in the bunch. White mulberries are known for their super sweet flavor and are really good for making raisins out of. Anyway Ranger Ken is the care taker of the Railroad Square Park, he’s a local gardening guru and can often be found selling produce at the local farmers markets. This mulberry is his favorite of the three we determined to be the best of the ones growing within the park. The fruit are large over an inch in length, the flavor has a nice rich honey sweetness to it. Fruit ripens early May . Zones 7-9. Silk Hope is a Morus alba x rubra hybrid from North Carolina. Berries are 1 ½ inch long, black with an excellent sweet tart flavor. 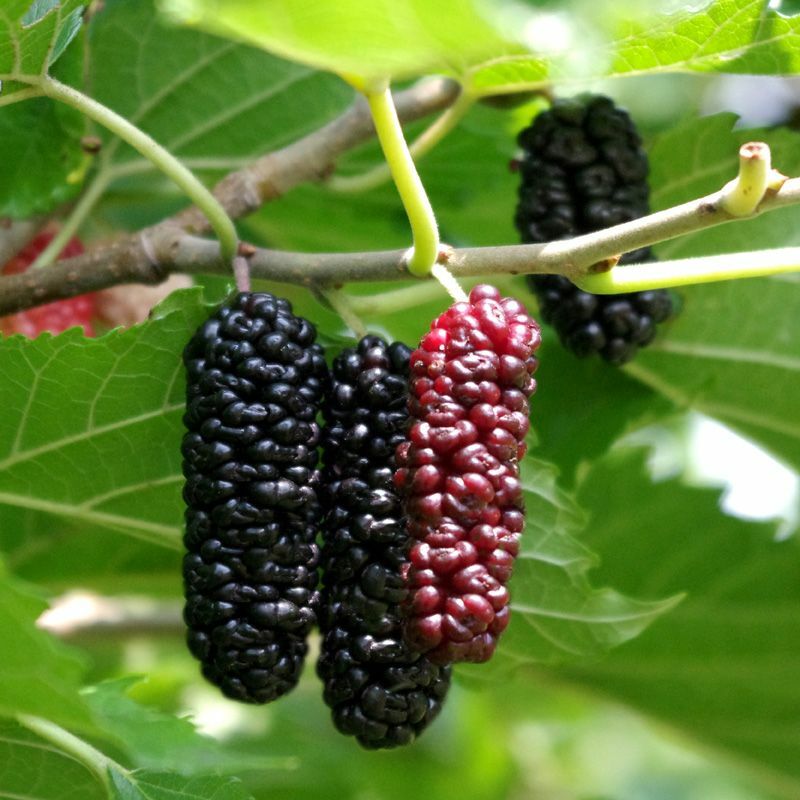 It has been shown to even out produce the Illinois Everbearing mulberry! Silk Hope is a selection and favorite of Dr. A.J. Bullard, long time NAFEX mulberry consultant. Ripens in May. Zones 5-9. 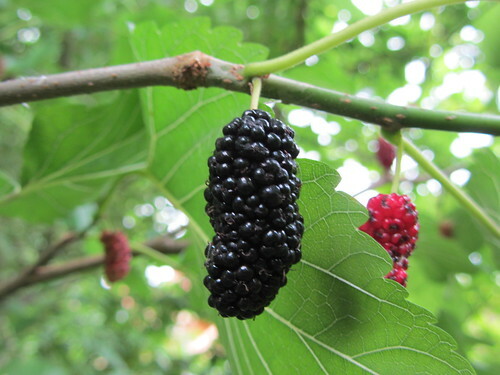 Since mulberry leaves are the sole food source of the silkworm, some American trees date to the early 1800's, when North Carolina was part of a thriving silk industry which was soon eclipsed by foreign competition. Silk Hope, discovered by A. J. Bullard, boasts this historic distinction and thrives better than most in the South. It bears 1-½ inch long, sweet, black fruit that ripens for two months in early summer. Sweet Lavender Mulberry This cultivar produces quantities of flavorful white fruit which won't stain and look attractive on the tree. Fruit is enjoyed fresh or dried. Sweet white fruit. Tehama (Giant White) Produces heavy crops of very large, white fruit up to 2-3/4" long and 1/2" wide that is very sweet and succulent. Beautiful vigorous tree has attractive large leaves and makes a fantastic quick growing shade tree. Great for eating fresh off the tree, drying, or making into pies. It is also a good tree to plant for chicken and other poultry forage. Originated in Tehama County, California and hardy zones 7-9. Wacissa mulberry was found in the sleepy little town of Wacissa Florida. The original tree must be close to 70 years old and continues to bear heavy crops of 1 1/2 inch deep purple fruit. Rich sweet blackberry flavor, very soft and juicy. Fruit ripens in May. Zones 7-9. Weeping Mulberry Morus alba pendula) This is an amazing ornamental tree that can grow in a wide arc that sweeps to the ground. Stake it up to the desired height and then let it weep. The tree is loaded with tasty, small fruit that turn reddish black when they are ripe. USDA Zone 4-9. Wellington Heavy producing tree of reddish- black medium size 1-1/4" long cylindrical fruits with good flavor and quality. Originated in Geneva, NY on the property of Richard Wellington, this old American cultivar is well known as being one of the best hardy mulberries. Zones 5-9. 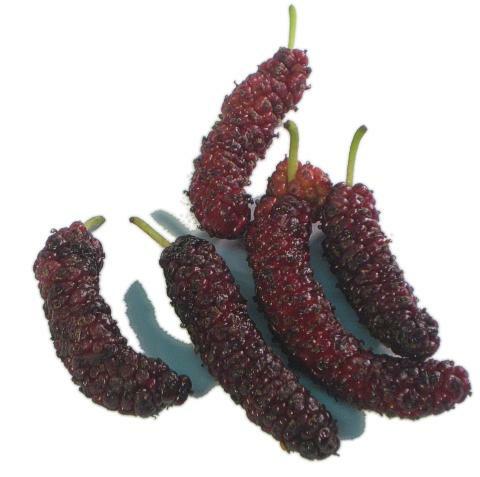 Hi, I'm from Turkey, I grew up eating mulberries (white), but since moving to Seattle I haven't been able to find them here. I've been looking for them, asking every fruit stand for years. Any idea which store/fruit stand/farmers market would have them for sale? Thanks! i had to get mine online, burnt ridge nursery sells them as well as rain tree. on the trail at Snoqualmie falls down to the waterfall there's a bunch of wild trees. If you want some I only have a few to spare. I'm not sure how much you need. Hi dear Ben.B. 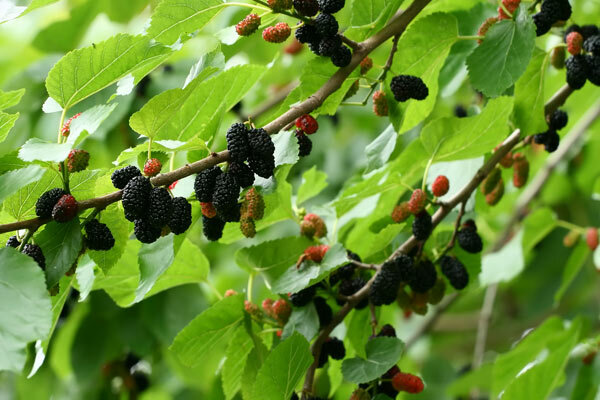 I am c j Prabhakar from India a retired Scientist from sericulture (the silk production technology) from India and would like to interact with you (at your free time) on mulberry tree resources around Seattle in specific and Washington state in general. I am here in Seattle from today for next one and a half months with my daughter who works for amazon.will you spare some time please? Hi, I'm in the UK what 'zone' am I in please?